Developed by Mindspark Interactive Network Inc, Weather Blink is advertised as a toolbar that can provide you with local weather forecasts, severe weather warnings, and other weather-related information. Although that may be the case, you should know that the app is powered by Ask and that it is ad-supported. This means that it will present you with various advertisements. When you interact with them, the creators of the application make money. Computer users do not benefit from the software at all. In fact, it causes unnecessary disruptions and slow downs. We suggest that you delete Weather Blink from your computer without further delay. How does Weather Blink work? 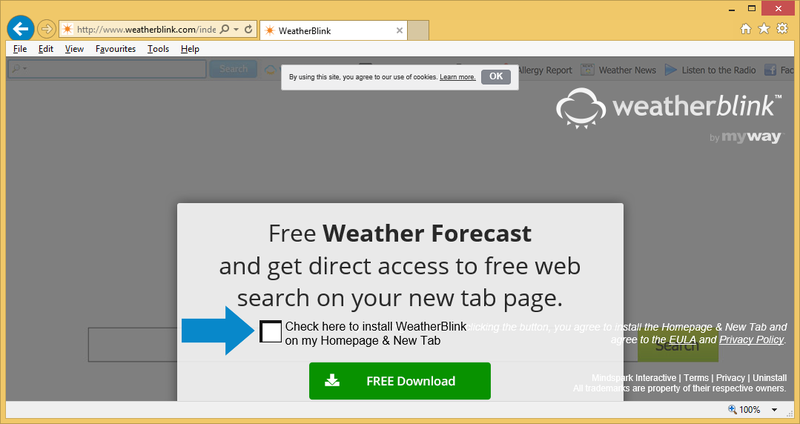 Weather Blink has an official page, which describes the toolbar and allows you to download it. However, it is rather unlikely that you intentionally downloaded the program from its site. Instead, it is most likely that it arrived onto your system bundled with other software. Free third party software usually enters systems with additional apps, which are presented to users in the installation wizards. It must be mentioned that the optional offers often appear in the Advanced or Custom mode and are pre-selected. This means that if you make no changes to the setup and just click “Agree” in every step, you will install potentially unwanted programs onto your computer without even realizing it. Once inside, the toolbar will be added to all of your browsers. It will contain several quick access buttons leading to weather-related pages and a search box linked to Ask Search engine. If you make use of the engine, you will get results that will have sponsored links in them. Moreover, you will see various adverts on all pages that you open. They will show up in the form of banners, pop-ups, coupons, links, and so on. You may also experience redirects to unfamiliar domains in the middle of your surfing. It is clear that none of these symptoms are beneficial in any way, so if you wish to stop them, you will have to get rid of Weather Blink. How to remove Weather Blink? To erase Weather Blink from your browsers and your PC, you will have to choose between two possible removal options. You can uninstall Weather Blink manually or you can delete it automatically. The automatic removal comes with additional advantages like making sure that your computer is clean from other threats as well. If you use the anti-malware from our site, it will scan your system, detect all unsafe components, and eliminate Weather Blink along with them. Furthermore, the utility will stay useful moving forward as it has malware prevention and other valuable features. The alternative solution is to terminate Weather Blink manually. You will have to uninstall the app from your computer and fix your browser preferences, in case they have been modified. Manual Weather Blink removal guide is provided right below and you are welcome to follow it.